This piece was worked in a pilot class taught by Dawn Donnelly. We were instructed in advance to bring any shells we had collected, and were encouraged to share with one another, which we all enthusiastically did. 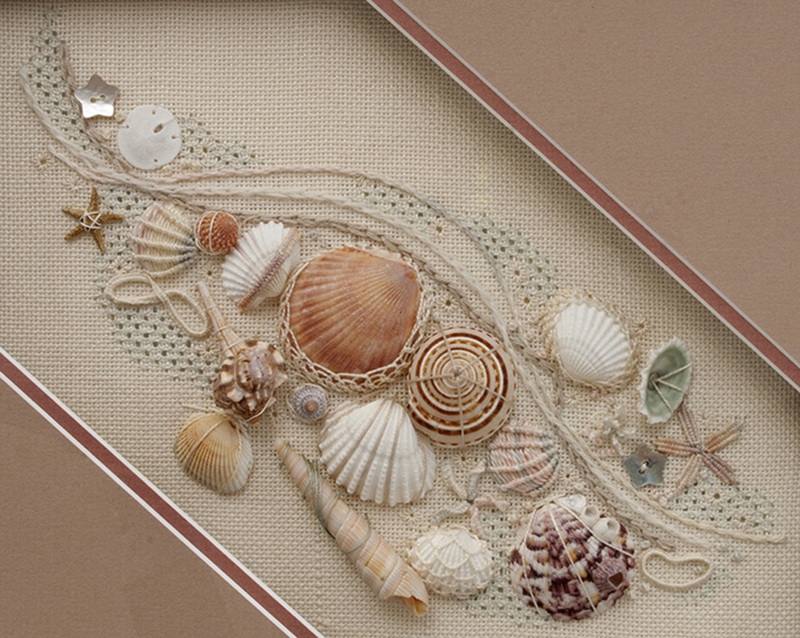 The shells definitely dominate the design, but embroidery elements are added to enhance the beach effect. Most of the shells are attached with such embroidery techniques as needlelace. And some sea treasures are created with well-chosen threads: scallop shells created with ribbed spiders, sea stars with needleweaving and cast-on bullions, hedebo rings scattered about. I added some pulled thread worked in a seafoam green. I selected this color to reflect the green of the inside of the one green shell, to give more unity to the piece in both color and feel. This piece was great fun to stitch.